Artificial intelligence is transforming most industries. Virtual reality, automation and the internet of things are not only leading the revolution in consumer electronics and various types of gadgets but also steering the transformation in the manufacturing sector. Industrial A.I. is slightly different from the types of sensors being used in consumer goods, the internet of things in the context of home automation and virtual reality in gaming among other applications. Industrial artificial intelligence is more complex. It is as much reliant on big data as it uses small data. The evolution of industrial artificial intelligence has been phenomenal in the last twenty years. Right now we are poised at Industry 4.0 and the revolution is already in full swing. 2019 will be a watershed year for manufacturing. Industry 4.0 will bring in small to medium enterprises. Large original equipment manufacturers have already deployed artificial intelligence in varying measures. The scope will expand. Certain domains in manufacturing that are yet to adapt will take the leap this year. While most people think that artificial intelligence is most resoundingly experienced in interactive applications, the actual impact is being witnessed in manufacturing as old practices are not just being changed but abandoned. The advancements of interconnected networks and systems relies on reliable database management services to keep all the various components working effectively. Proactive Maintenance with Industrial A.I. 1 Proactive Maintenance with Industrial A.I. 1.3 Collaboration of Experts and Industrial A.I. Industrial A.I. has paved the way for smart maintenance. The manufacturing industry has been largely steadfast with its core operations. Most manufacturers prefer a proactive approach when it comes to identifying problems. However, a plethora of problems remain elusive till something in the apparatus breaks down or malfunctions. Artificial intelligence has resolved that problem. It has made predictive smart maintenance possible. The challenges of upkeep have always plagued most manufacturers and they are the most common cause for downtimes. While all manufacturers factor in a possible downtime in their modus operandi, it is best avoided and an even better alternative is to preempt the issues so the operation continues unimpaired for as long as needed. Manufacturers lose around fifty billion dollars every year due to downtime. This is a nationwide figure. One can imagine the financial impact on a global scale. All operations that are reliant on assets throughout the production process can be improved exponentially if unplanned downtime can be reduced or completely prevented. Failure or assets is the cost of over forty percent of unplanned downtime. Industry 4.0 is about identifying signs of such asset failure even before they have become remotely obvious to the supervisors or the operations staff. Preemptive or proactive maintenance is not an option. 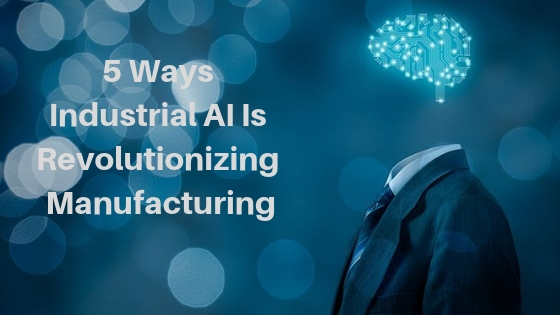 Given a choice, every manufacturer will consider it to be imperative and that is precisely what industrial artificial intelligence can do with unfailing regularity. Advanced algorithms, machine learning, artificial neural networks and state of the art sensors can predict asset failure and thereby preemptive maintenance can resolve issues before they become problems. Such maintenance can be scheduled. Some upkeep may be sporadic. This transformation in the manufacturing sector is expected to be the starkest this year. Industry 4.0 is reliable. Artificial intelligence has been undergoing major changes over the years and many applications in conception were not always reliable when executed in real scenarios. Industrial A.I. is now poised at a juncture wherein it can adapt to the specific demands of different types of manufacturing. Products are becoming complex and hence assembly lines are now more elaborate. There is no room for manufacturers to go wrong as the consumers or even industrial clients have the standard expectation of flawless products. No one is even remotely interested in accepting the very real possibility of unintended errors. Product recalls and outright faulty devices or operations can ruin the reputation of manufacturers. Artificial intelligence is ushering in systems that can maintain the highest levels of quality. It is not only the consumers or clients that expect flawless products. The regulatory authorities and their stipulated standards have become challenging. As more companies improve their products and deliver better efficiency, reliability and durability, the regulations are bound to get stricter and complying can be an uphill battle. Industrial A.I. simplifies compliance without breaking a sweat. It should be noted that the compliance assurance process is also expedited. Artificial intelligence powered systems work much faster than human interventions. Recommended: What are SOC Managed Security Services and Why do you Need Them? Collaboration of Experts and Industrial A.I. Those who have been neither optimistic nor pessimistic about industrial artificial intelligence have always expected a fine collaboration between humans and robots. Those ringing the alarm bells and many who have been skeptic about the implementation of artificial intelligence in various facets of the real world have also been less pragmatic about the practical possibilities. Nearly one and a half million robots are already at work in various industrial facilities or factories around the globe by the end of 2018. This number is going to increase rapidly throughout 2019. Contrary to what has been feared and not entirely without reason, we have not witnessed a job loss in millions as an effect of the robots taking their rightful place. This naturally proves there is sustainable collaboration between humans and robots. This collaboration will become more diverse in the next twelve months. The collaboration is not limited to the operation or the core manufacturing process. The workforce is teaming up with robotics in various forms for design, programming, maintenance and more. Robotics is primarily dealing with cognitive jobs and autonomous operations. The human workforce has made space for robots to work on environmental data in real time and such an intervention is optimizing most processes. Humans will still hold the key and be the only authority in manufacturing, as is the case in other industries. But the collaboration will become more crucial in the near future. Artificial intelligence has already showcased its relevance in design. The scope was limited to precision or accuracy in many cases. It is now being expanded so engineers and designers are relying on artificial intelligence algorithms for generative design. Many manufacturers have already implemented such software. The role is well defined with the brief containing all parameters and restrictions clearly detailed with data. Industrial A.I. algorithm works with the parameters including types of material, budget, method of production and schedule to consider all probable configurations and then recommends the best.